ASIAN AUTHOR Nury Vittachi, co-founder of the Hong Kong Literary Festival, is to be sacked by the organization’s board in a row about racial insensitivity and improper business links. The novelist, probably Hong Kong’s biggest literary export, alleges that the board fired him after he complained about racism and urged that “questionable business practices” be reformed. That he campaigned for years to set up a literary prize, but once sponsorship was obtained, he was cut from the project because of a Westerners-only rule. That the festival board, ostensibly non-profit, limits membership to directors and authors of Paddyfield.com and Chameleon Press, companies run by board member Peter Gordon. That prime slots in the festival programme were given to Chameleon Press novelists even if they paid for their own publication. Ironically, the Hong Kong author was this month invited to become honorary advisor to two other Asian writers’ conferences, the Galle Literary Festival in Sri Lanka and the Ubud Writers’ and Readers’ Festival in Bali. The row has blown open the normally sedate world of the Asian literati, where events typically consist only of a moderator, often Vittachi himself, having an earnest discussion about creative processes on stage with visiting authors. Vittachi claimed that after he transferred the rights to handle his work to publishers and distributors not related to the festival board, he was cut out of the administration of the Man Asia Literary Prize. Peter Gordon then set up a panel of white males to administer the prize, the author said. After Vittachi complained of racism, other Westerners, some of whom had Chinese ancestry, were brought in. “Why should we in Asia depend on people in North America and Australia to validate us? Will someone tell the board that the colonial era is over?” the author said in an email to a fellow novelist. At a festival board meeting on January 9th, there was no support for reforms proposed by Vittachi, he was castigated for an entry on his blog, and told that a decision to sack him had been made and would be ratified at the next meeting, on February 5th. Sri Lanka-born Vittachi claims to have played a role in starting a literary festival spin-off called the Man Asia Literary Prize, for “works as yet unpublished in English”. The concept came from the manifesto of Dimsum, a literary magazine launched in 1999 with friends such as author Xu Xi. “We designed the journal for ‘works as yet unpublished in English’ as it enabled us to include authors who worked in English and those who had written fine works in vernacular Asian languages,” he said. After attending a 2005 literary award for an unpublished manuscript in Australia, he proposed the Dimsum principle be the basis of a new prize. He and other board members made a presentation to the Man Group, a hedge fund firm which finances the Man Booker Prize, and got an immediate green light. However, after Vittachi changed his publishing and distribution arrangements, he was told by Gordon that he could no longer play any role in the administration of the prize. Asian authors were excluded because their job was to win prizes, not judge them, he said. The festival board named three Caucasian males who had been lined up, and there was talk of a fourth place possibly going to an Asian. Vittachi’s complaint of “tokenism” was dismissed but the board later revised the prize administration to its current line-up, with Gordon of Paddyfield.com (an American) as chairman, and three judges: an American, a Canadian with Chinese ancestry and an Australian. During the January 9th meeting, board member Rosemary Sayer said she had used a device in her handbag to record a conversation with Vittachi at a branch of Pacific Coffee where he had expressed concern about racial and business bias. History is being repeated. The festival’s other progenitor also left under a cloud after complaining about Paddyfield.com involvement. Camens, who now lives in Australia, said she was dismayed by the way that a single group now dominated the festival she started. “I had envisaged the festival as a community-owned event, which would self-sustain and build a platform to showcase writers writing from or about the region, and to build Hong Kong’s reputation as a territory that supported literature,” she said. What happened at the Hong Kong festival “broke my heart”, she added. Camens went on to become founder of the Asia-Pacific New Writing Partnership, a network of authors, academics and literary event organizers around the region. This report was compiled after access was given to email records of the parties on both sides. The communications between the board and Vittachi confirm that he expressed concern about the Westerners-only composition of the literary prize administration, and about how business decisions drove festival ones. At one stage, board member David McKirdy was in favour of expanding the board, but later failed to support Vittachi’s proposals to do so. Yet the complexity of the inter-related arguments suggests the quarrel is not as clear-cut as Vittachi makes out. Since he himself was a significant player in the festival and the publishing firm involved since the outset, why had he not spoken out earlier? Why only go public after being sacked? Both principal players in this drama are deeply ambitious people. Gordon is a spiky character, admired for his acumen by some but not well-liked by other booksellers and publishers in Hong Kong. Vittachi is infamous as a self-absorbed, aloof, workaholic author, but is well-connected and widely liked. Without the Asian author, the festival board consists of Peter Gordon and his wife Elaine Leung, who run online bookseller Paddyfield.com and Chameleon Press; Rosemary Sayer, a public relations specialist; and David McKirdy, who describes himself as “a car mechanic”. Both are Chameleon Press authors. The administration of the Man Asia Literary Prize consists of Peter Gordon; Adrienne Clarkson, a Canadian author of Hong Kong extraction; Andre Aciman, an America-based author of Egyptian origin, and Nicholas Jose, an Australian author. While Vittachi’s claims of racism may initially seem hard to swallow given that two of the men on the festival board have Asian partners, yet it is difficult to escape the conclusion that there has been, at the very least, racial insensitivity and a blur between business and festival matters. There is little doubt that Vittachi was one of the key progenitors of the Man Asia Literary Prize. To cut him out after he changed publishers was a move that had to raise eyebrows in the industry. 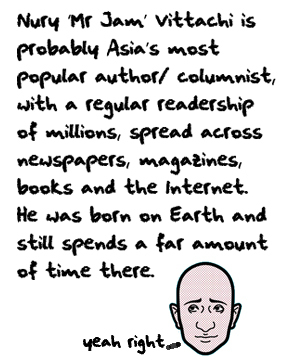 As an extremely well-connected Asian author whose career is in the ascendancy, he would have been an ideal figurehead. In 2007 Vittachi is scheduled to be a featured author at festivals in Germany, Australia and the UK. Furthermore, with a chairman and judges from North America and Australia, the Asian literary prize now feels uncomfortably non-Asian. Without Vittachi, there is no involvement whatsoever from south Asia, the widely acknowledged home of Asian genius in English literature. Whatever happens, festival-watchers say the row is likely to force the board to institute the major reforms its outgoing founder recommended. It appears obvious that the group would benefit from having other Asian publishers and bookshops involved, and it will eventually have to open itself up to new members--and preferably Asian ones. Meanwhile, Vittachi’s avowed mission to champion the rights of Asian authors and publishers has had a setback, but he is unbowed, and hard at work on “bigger and better” projects. “I’m just getting started,” he wrote this week to one international publisher.